“[The Senate] votes unanimously to pass…a resolution regarding the dissolution of the Department of Economics and Policy Studies. Of course, delay would bring light to a situation best kept quiet. One word to leave you with this evening: shameful. 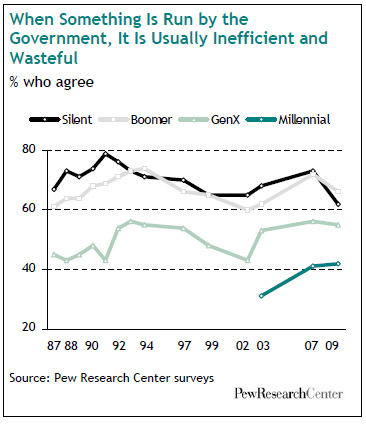 Some of this divide may be due to mere youth; perhaps people get more antigovernment, and more conservative, as they age…Disentangling the cohort effects from the life-cycle effects is difficult. 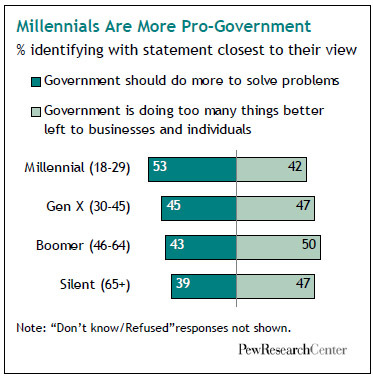 Much of the survey data Pew has collected doesn’t go far back enough to determine whether earlier generations were equally pro-government and liberal in their own youth. Nevertheless, some of the more specific questions have interesting ramifications. While social “pendulum” theory might predict a swing towards government in this past year’s data, most of the numbers actually trend against government from 2007 to 2009. Overall, I tend to take these differences with the grain of salt recommended in the “cohort” disclaimer. The gaps aren’t big enough to be explainable by much more than relative youth. 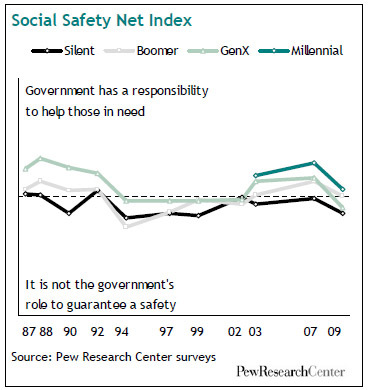 It is curious though that numbers like the “safety net” question have trended downwards in the last year; mistrust of government is certainly rampant after the bailout, yet other polls seem to show most Americans believe strongly in unemployment insurance and the like. Perhaps this is a case like health care reform where the question is too general and the components of the entity in question are much more popular than the entity itself. Either way, the survey has a lot to dig into. Alan Greenspan, Milton Friedman, and Larry Summers, in that order, have been judged the economists most responsible for causing the Global Financial Crisis. The 7,500 voters at the Real World Economics Review blog have thus bestowed on them the Dynamite Prize in Economics. I voted for Greenspan, but my other selections of Eugene Fama and Robert Lucas earned the 5th and 7th places. I was first drawn to a recent article published by Ben Block of Worthwatch Institute about the prospects of REDD, which is the mechanism aimed to reduce emissions from deforestation and will play . The Copenhagen Accord offered support for this mechanism, and on the surface, it seems like a good way for less developed countries to be rewarded for their preservation of otherwise endangered lands. While support for the policy has grown, considerable progress is still necessary before multinational organizations, national governments, and local authorities are ready to administer REDD programs, analysts said. Without proper reforms, the program threatens to increase human rights violations, land conflicts, and forest-sector corruption, and REDD’s ability to reduce emissions would be in doubt. “If significant payments were to flow today, REDD programs would be challenged to meet the tests of effectiveness in reducing emissions, efficiency in channeling funds, and equity in distribution,” said Frances Seymour, director general of the Indonesia-based Centre for International Forestry Research. In areas where land rights remain unclear, governments or private industry may displace forest communities from their homes to gain access to forest carbon, human rights campaigners warn. Where indigenous groups or communities clearly own the forests, environmental and human rights groups are reporting instances of REDD project developers offering contracts without fully explaining the deals’ consequences. However, while Kenya has never been better positioned to rise to the challenge, political will to convert legislation into real change on the ground cannot be taken for granted. Successful implementation of the ruling on the Endorois will require vital monitoring support from the commission itself. The stakes on land issues are undoubtedly going to increase with REDD, and it’s unclear if African governance is adequately prepared to handle it. By embracing offsets, and REDD with them, the developed world could be unwittingly open up a destabilizing can of worms. The other issue I want to raise is environmental valuation. I think this valuation can be a good thing. For instance, an eye-popping report was just released that said the world’s largest corporations caused $2.2 trillion of environmental damage in 2008, half of which was from CO2 emissions, in total equivalent to 1/3 of these company’s profits. Making the public aware of these huge damages is critical. However, the tricky thing with environmental valuation is that even if high totals like this one are reached, they may still be underestimates. Holistic economics – or economics that recognise the value of nature’s services and the costs of their loss – is needed to set the stage for a new “green economy”. there is a point when it becomes meaningless to treat the ecosystems upon which we depend as mere commodities with a price for trading. For example, what price would you put on the additional tonne of carbon which, when burned, triggers irreversible, catastrophic climate change? Who would have the right to even consider selling off the climate upon which civilisation depends? The avoidance of such damage is literally priceless. This dilemma between wanting to make polluters pay and avoiding the ultimate category mistake urgently needs to be discussed. We must also learn not to tie ourselves in nonsensical knots when using side-by-side the terms “value”, “price” and “measurement”. The concern of underestimation, perhaps even exaggerated by Simms, is a valid one. However, economists feel the need to place a value on everything. Offsets essentially are founded on the ability to value certain environmental activities and abstentions. If they miss the mark (and my guess is they will skew to underestimation), the environment and our economy’s future capability will suffer. Finally, even if offsets can be correctly valued and land issues reconciled, will they actually, err, offset any emissions? Stacy Feldman at SolveClimate has an investigative piece on some of the issues with offset schemes. Because these projects can be in far off lands that are tough to track, it can be hard to know what’s real and what’s hype, other than trusting what the company says, said Jutta Kill, head of the climate and forests campaign for UK-based FERN. The Eco2 advantage, says the firm, is its fast-growing strain of Kiri tree. “Seven years is incredibly quick,” said FERN’s Jutta Kill, who said she had never heard of the Kiri tree. Fred Stolle, a program manager for WRI’s Forest Landscape Objective, said a fast-growing species is not a strong selling point for carbon reduction. “And if you use it for firewood, of course you burn the whole thing. I don’t see any reason why that form of business should get carbon credits,” he said…. The other major key to Eco2’s model is selling carbon credits before the trees exist, a common practice…But according to Kill, forward selling is risky for investors and local communities. The system is helped by the fact that there is little time and money for quality control. I apologize for the length of this post, but I think the issues associated with offsets are critical for understanding the shape of climate legislation. This fight may be in vain, as REDD seems even more firmly seated in conventional wisdom than cap-and-trade itself. Nevertheless, policy makers need to think long and hard about the human and environmental consequences of adopting this flawed mechanism. Here are some links for your Friday enjoyment. I have a post in the pipeline about carbon offsets, so keep an eye out for it if this topic interests you.